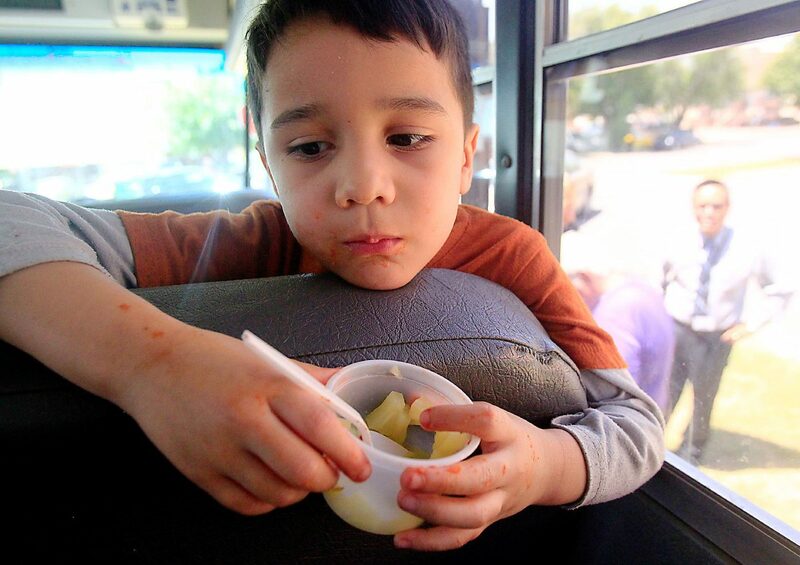 Isaiah Hernandez, 5, chews on pineapple pieces after eating a spaghetti lunch on July 31, 2014 inside a McAllen ISD school bus as part of the Summer Food & Nutrition Program. The program provides free, nutritious meals at selected McAllen locations to children up to 18 years old during the summer months. McALLEN — The McAllen Independent School District announced the kickoff of its annual Summer Feeding Program which aims to provide breakfast, lunch and dinner to children in the most underserved communities across the city. Starting May 30, 63 sites will begin serving several hot meals per day— mostly pairing breakfast and lunch, lunch and snack or snack and dinner — to any child 18 years of age and under, with no documentation or registration required. The city is partnering with the district to promote the program and provide access to city facilities to be used as sites to serve the meals. These include the McAllen International Museum, the public library and local parks such as Firemen’s Park and Spray Ground Park. The summer program also includes 15 bus routes, dubbed Meals on Wheels, which will deliver meals to some of the less accessible neighborhoods such as routes along South 27th Street, Buddy Owens Boulevard and Ebony Avenue. Children can visit more than one site to get four meals a day. Other sites include churches, McAllen ISD schools and community centers. The program is part of the Texas Department of Agriculture Food & Nutrition Program Summer Meals which funds the meals. Last year alone the district reported serving more than 200,000 meals during the summer. For a complete list of meal sites please visit the McAllen ISD website, mcallenisd.org, or call the school district’s Food Nutrition Program at (956) 632-3226.